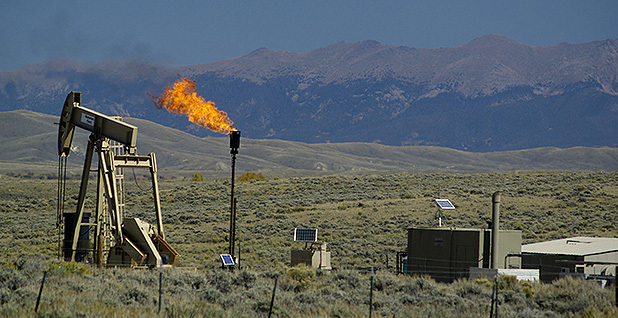 An Obama-era rule for methane emissions from oil and gas development on public lands is fully in force for now after surviving two rollback efforts by the Trump administration. But oil and gas lawyers say companies couldn't follow the standards if they wanted to. That's because the Interior Department doesn't have the right systems in place for compliance, they say. That frustration cropped up in a legal filing last week in which industry lawyers pushed the U.S. District Court for the District of Wyoming to give oil and gas companies some relief by suspending the core provisions of the Bureau of Land Management rule. "Compounding the problems of compliance, royalty reporting under the Waste Prevention Rule is currently not possible," Western Energy Alliance President Kathleen Sgamma wrote in a declaration to the court. "BLM and the Office of Natural Resources Revenue (ONRR) have not coordinated or set up the necessary reporting systems ... to allow for new royalty reporting conventions under the Waste Prevention Rule." The 2016 regulation — which aims to cut methane emissions on public and tribal lands — was designed both to address climate change and to minimize the loss of natural resources and royalty money. A federal court in California knocked down two attempts to stall the standards, reviving the regulation in full last month (Energywire, Feb. 23). A BLM spokeswoman said this week that the agency expects operators to comply with the rule. Though the Trump administration is planning a broader rollback, that process won't be complete until August at the earliest. Meanwhile, the Wyoming court could act any day on drillers' request to freeze the regulation, but that outcome remains uncertain. Some drillers are now struggling with compliance, as they believed most of the rule's provisions had been effectively sidelined last year and didn't make the necessary preparations. Part of the rule changes how operators calculate what they owe the government, clarifying when drillers must pay royalties on "avoidable" losses of natural gas. Companies file that information through a production reporting system run by ONRR, an Interior office. But they say the agency hasn't yet updated "disposition codes" used in the system to reflect the changes. "Without updated and accurate Disposition Codes, Alliance members are unable to submit royalty reports to ONRR that reflect new royalty payment calculations required under the Waste Prevention Rule," Sgamma said. "Alliance members have tried to report royalty payments using outdated Disposition Codes, but these reports are being rejected." The Independent Petroleum Association of America and Western Energy Alliance say the problem is exacerbated by the Interior Department's failure to offer any guidance to operators on how to comply with parts of the rule. "Since the Waste Prevention Rule was reinstated one month ago, some operators have attempted to comply but encountered widespread confusion and uncertainty within BLM and ONRR over its implementation," the groups told the court. "These agencies are unable to provide industry with guidance on how to implement the rule or respond to questions. BLM field offices have indicated that there has been no staff training on rule implementation or formal written directives or other guidance from BLM headquarters." In an email yesterday, BLM spokeswoman Amber Cargile noted that "the full rule is now in effect as promulgated" and confirmed that the agency expects compliance. She said drillers should use the existing disposition codes for production reports to ONRR. "The BLM expects operators to comply with all BLM regulations that are in effect, and operators are able to submit complete and compliant royalty reports to the Office of Natural Resources Revenue (ONRR) using current Disposition Codes," she wrote. "The BLM will consider developing additional enforcement and/or compliance guidance should the need arise." Cargile referred further questions about the production reports to ONRR, which did not respond by publication time to a request for comment. In recent court filings, lawyers for Interior did not mention any technical barriers to enforcing the rule but suggested the agency's "limited resources" would be better spent elsewhere. They told the Wyoming district court that setting the rule aside would "allow BLM to focus its limited resources on completing the revision rulemaking rather than administering a rule that it is in the midst of reconsidering." The compliance complications alleged by industry are just the latest turn in the methane rule's zigzagging path. Since its unveiling in late 2016, the regulation has faced four rounds of litigation — the ongoing case in Wyoming, two cases the Trump administration lost in California and a scuttled appeal at the 9th U.S. Circuit Court of Appeals. For oil and gas operators, the compliance question is urgent. The full methane rule has been back in effect for a month, and companies working on public and tribal lands are required to comply. "Now that all provisions of the rule are arguably in effect, Industry Petitioners' members risk enforcement, penalties, and additional royalty for noncompliance," industry lawyers told the Wyoming court last week. Along with the adjusted royalty calculations, companies must conduct leak detection and repair (LDAR) inspections at well sites, update certain equipment, and install new devices on flare stacks and storage tanks. Some exemptions are available, but the industry groups worry BLM is not prepared to process applications for those. The Obama rule requires operators to submit their first annual reports detailing LDAR inspections by the end of this week. Anyone filing a false report would be subject to civil and criminal sanctions. "Having been suspended for nearly six months during 2017, it is impractical for many operators to complete the necessary LDAR surveys in the 29 days since reinstatement of the rule given the sheer number of wells involved to constraints to constraints with availability of equipment and personnel," the groups told the Wyoming court. Sgamma warned that some companies may have to shut in wells either temporarily or permanently to avoid liability for noncompliance. Even if the Trump administration takes a lax approach to enforcing the methane rule, companies worry that environmentalists or a future administration could take legal action against them (Energywire, March 8). Environmental advocates and others are already monitoring compliance for other Obama-era rules the current administration is charged with enforcing. The group Earthworks, for example, has used infrared cameras to identify oil and gas sites that could be emitting excessive methane. Environmental groups and a coalition of states and cities have also asked U.S. EPA for records on how companies are meeting that agency's separate methane standards for new oil and gas sites.